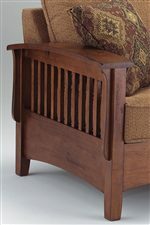 The upholstered love seat features mission-like slats, gentle arches, and clean lines. The transitionally styled love seat is an ideal addition to any living room. The Westney Upholstered Love Seat by Best Home Furnishings at Best Home Furnishings in the St. Louis, Chesterfield, St. Charles, MO & Waterloo, Belleville, Edwardsville, IL area. Product availability may vary. Contact us for the most current availability on this product.